There are approximately 6 million automobile accidents in the United States every year. While many of these involve property damage alone, one in three crashes involve personal injuries to either the driver or a passenger. 1. STOP – Never drive away from the scene of an accident, even a minor one. If any vehicle is blocking traffic or otherwise in an unsafe area, go to Number 2 and then move the vehicle(s) as soon as possible. 2. PROTECT THE SCENE – Before moving your car, if you are able to get out of your vehicle, take pictures, not just of the car, but the street to show any markings, if there are any identifying landmarks on the side of the road, as well as any stop signs or stop lights. 3. CALL THE POLICE– Even if there are no serious injuries, it is a good idea to call the police. You may need a police report to file a claim with your insurance company, even if it is just to make a claim for damage to your vehicle. If the police do come, make a note of the precinct from which they were dispatched so you can get the report, if one is made. 4. EXCHANGE INFORMATION AND TAKE PICTURES OF THE OTHER OPERATOR’S DRIVERS LICENSE AND REGISTRATION – Usually, an investigating officer will take all information from both parties. However, without having the other driver’s information, how do you know it is accurate? Get the name, address and telephone number of all persons involved in the accident, drivers and passengers alike. It is important to ask for the registration as frequently the driver is not the owner, or the owner is a company. You should also obtain information about insurance by asking to see the insurance card for all vehicles involved in the accident. If there are witnesses, you should get information from them as well so that you or your attorney can contact them in the future. 5. MAKE SURE THE FACTS ABOUT THE COLLISION ARE ACCURATE – When the police arrive, make sure you tell the investigating officer(s) exactly what happened, to the best of your ability. If you do not know certain facts, tell that to the officer. Do not speculate, guess or misstate any of the facts. If you are asked if you are injured and you are not sure, say you are not sure, rather than no. You may be in shock, or you may be focused on passengers, such as children. You should also make sure statements made by other persons involved in the accident are accurate as well. It is almost impossible to amend a report once it is made, so make certain the statements made by all parties are accurate. 6. REPORT THE ACCIDENT – Notify your insurance company as soon as possible. Many policies require immediate reporting and full cooperation. There are many reasons for doing this but I believe the most important is that you should be the first one to report the facts of how the collision occurred, especially if there is a dispute. Also, if the other vehicle involved in the crash cannot be identified, your insurance company needs to be notified as soon as possible. Further, if you are injured, some medical providers will not provide treatment unless a claim is set up. Oftentimes, one of the insurance companies will ask for you to give a recorded statement about how the accident occurred, as well as discuss your injuries. In Massachusetts, your insurance company may deny coverage if you fail to do so. You are, however, under no obligation to give a recorded statement to the insurance company for the other driver. 7. IF YOU FEEL ANY PAIN OR DISCOMFORT, SEEK MEDICAL ATTENTION – Often, injuries caused by motor vehicle crashes are not immediately apparent. Many individuals feel pain a day or two following a car crash. Studies show that sometimes the most minor of car crashes cause the most serious of injuries. It is not just the impact that causes injury but how your body reacts to such an impact. Unless you are absolutely certain you were not injured, you should seek medical attention at your local emergency room or by seeing your family physician. 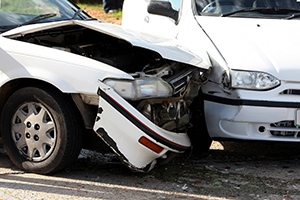 Even the most minor of collisions can cause serious and permanent injury. If you lost consciousness or were dazed for even a short period of time following the collision, you may have suffered a concussion or closed head injury. 8. IF YOU WERE IN THE COURSE OF YOUR EMPLOYMENT AT THE TIME, CALL YOUR BOSS – Workers compensation laws are different in each state. In Massachusetts, employees have an obligation to report an injury to their lawyer “as soon as practicable” after an injury. Your rights to receive worker’s compensation benefits may be affected if you fail to tell your boss as soon as possible. 9. KEEP A FILE OF THE MATTER – Keep all your accident-related documents and information together. This information should include a claim number, the claim’s adjuster who is handling the claim, names and phone numbers of all contacts, receipts for a rental car and other expenses incurred as a result of the accident. When you are involved in a car crash, you may seek medical attention and receive prescription medication before hiring a lawyer. You can provide any receipts you receive to your attorney at the initial consultation so he or she may start the process of getting you reimbursed for these expenses rather than having to wait. 10. CALL AN ATTORNEY – Perhaps the most important thing you should do after an accident is to consult an attorney. Personal injury attorneys work on a contingency fee basis, which means there is no legal fee unless the attorney recovers compensation for your injuries. Most important, an attorney can protect your rights and protect you from annoying calls from insurance companies and medical bill collectors. A reputable attorney will give you advice about your rights even if you may be deemed at fault for the car accident. You are still entitled to get your vehicle repaired, and you are absolutely entitled to get any medical bills incurred or lost wages reimbursed. While there are lawyers in Massachusetts who won’t take your claim because they will not get a legal fee, others will help you through the process of getting your car repaired and, most important, get the medical attention you need and ensure that your bills are paid. If you were involved in a collision and would like additional advice on how to protect your rights, please give me a call at 617-564-3299. The call is absolutely free, and there is absolutely no obligation.